The Time’s They Are A-Changin’ or Are They? There was a time, not so long ago, when being in an interracial relationship was actually dangerous. 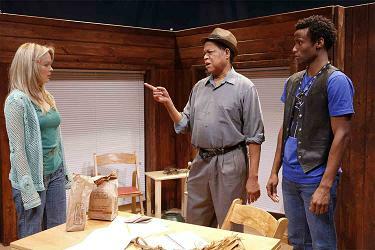 Sheldon Best as David at 22 and Auden Thornton as Stace at 22 in “Years of Sky” at 59 E59. Photo by Carol Rosegg. 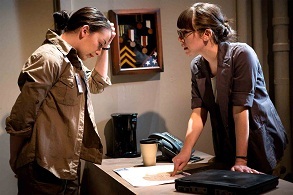 “Years of Sky,” directed by Christopher Scott at 59E59 Theaters through March 10th, follows the lives of a pair of star-crossed teens. 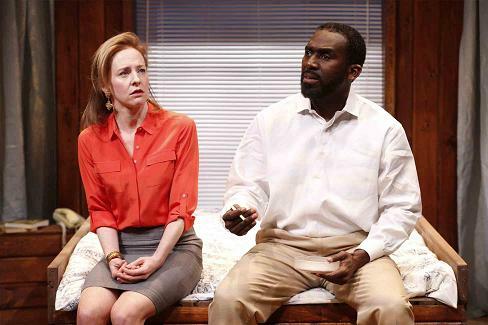 Amy Hargreaves as Stace at 45 and Gano Grills as David at 45 in “Years of Sky” at 59E59. Photo : Carol Rosegg. Stace (Auden Thornton) stays true to the dream that she and David (Sheldon Best) can be together in JFK’s more-perfect world. David’s love for her is never completely derailed by other allegiances. By the time they reunite as adults in 1992, David (Gano Grills) is married, and Stace (Amy Hargreaves) is still idealistic. Auden Thornton (Stace at 22)., Tood Davis (Ben) and Sheldon Best (David at 22). The cleverly executed sets, constructed by The Ken Larson Co. from Rebecca Phillips fine designs, make excellent use of the small space in 59E59’s Theater C.
Among the personable ensemble, Auden Thornton as Stace at 17 and 22, Amy Hargreaves as Stace grown-up and Sheldon Best as the younger David are standouts. Todd Davis rounds out the cast as David’s dad, Ben. For more information and tickets for “Years of Sky,” please visit www.59e59.org. For Better or Worse in "Katie Roche"
Irish playwright Teresa Deevy was a master of middle-class parlor-room dramas. “Katie Roche,” at the Mint Theatre throough March 24th, is about a young serving girl who marries the master of the househould. Like most of Deevy’s characters, Katie (Wrenn Schmidt) aspires to better herself. She’s sure she comes from “grand people” and it is her cockiness that Stanislaus Gregg (Patrick Fitzgerald) finds most appealing. Stan also has aspirations; he believes that marrying will help his career. 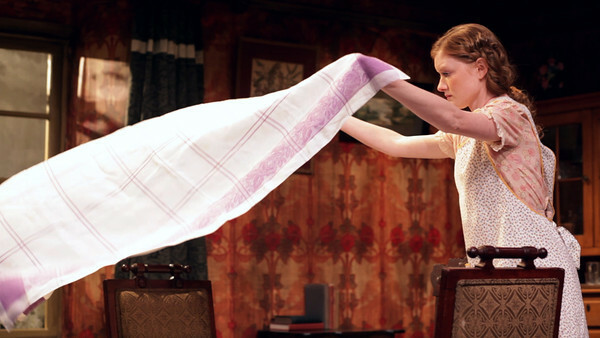 Wrenn Schmidt as Katie in “Katie Roche.” Photo by Richard Termine. Katie’s ascent from housemaid to mistress of the house does not go smoothly, of course. Amelia Gregg (Margaret Daly), Stan’s sister is kind. On the other hand, their married sibling, Margaret Drybone (Fiana Toibin) is a meddling gossip. It’s Katie, however, who is her own worst enemy, flirting with Michael Maguire (Jon Fletcher) and with disaster. Jon Fletcher as Michael with Wrenn Schmidt as Katie. Photo by Richard Termine. Deevy’s gentle, well-mannered comedy gets off to a slow start in the first act, but then quickly finds its pace. Wrenn Schmidt, as the headstrong Katie, Margaret Daly as her sweet employer turned sister-in-law, and Jon Fletcher as the charming working man who loses out on Katie’s affections are stand-outs in this nice ensemble. Jonathan Banks knows how to direct an old-fashioned story for the maximum pleasure of its viewers. Teresa Deevy’s “Katie Roche” celebrate the ordinary, making it extraordinary. “Katie Roche” is a lovely evening (or afternoon, for that matter) in the theater. To find out more about “Katie Roche,” The Mint Theatre, and the Deevy Project, please go to http://minttheater.org/. It’s been 100 years since a near-riot broke out in a Parisian theater, Théâtre des Champs-Élysées, as Vaslav Nijinsky staged his now notorious ballet for Sergei Diaghilev’s Ballets Russes. It is said that it was not Igor Stravinsky’s new and experimental “Le Sacre du Printemps” but the seeming brutality of the ballet that caused the outcry. Launched in the turmoil of conflicting artistic opinion, with that performance on May 29, 1913, Igor Stravinsky’s “Rite of Spring” has enjoyed its place in the sun ever since. In fact, Stravinsky’s music is one of the most recorded works in the classical repertory, and has had a great influence on many of the 20th century’s leading composers. This year, Igor Stravinsky’s beautiful work is getting the birthday bashes it deserves. And a revival of the Paul Taylor ballet “Le Sacre Du Printemps (The Rehearsal)”as an anniversary treatment as well. It’s like icing on the cake. Never one to shy from a controversy, Paul Taylor gives his take on the Vaslav Nijinsky original in “Le Sacre Du Printemps (The Rehearsal),” set to the two piano version of the revolutionary composition. In PTDC’s spring season, “Le Sacre Du Printemps (The Rehearsal)” will be performed on March 8th, 14th and 22nd at the David H. Koch Theater at Lincoln Center. http://www.vevlynspen.com/2011/03/keeping-it-relevant-at-paul-taylor.html, http://tbontheaisleatheaterdiary.blogspot.com/2011/09/celebrate-dance-with-paul-taylor-dance.html, and http://www.vevlynspen.com/2011/03/keeping-it-relevant-at-paul-taylor.html, http://tbontheaisleatheaterdiary.blogspot.com/2012/02/celebrating-50-years-at-ptdc.html) and the now 50-year old “Scudorama” among others. Michelle Fleet with Jamie Rae Walker, Laura Halzack and Julie Tice. Photo by Paul B. Goode. Nothing "old hat" about "Old hats"
There are times when there is nothing better than to be proven wrong. Pantomime and slapstick are two genres of comedy that have always left this reviewer unimpressed. 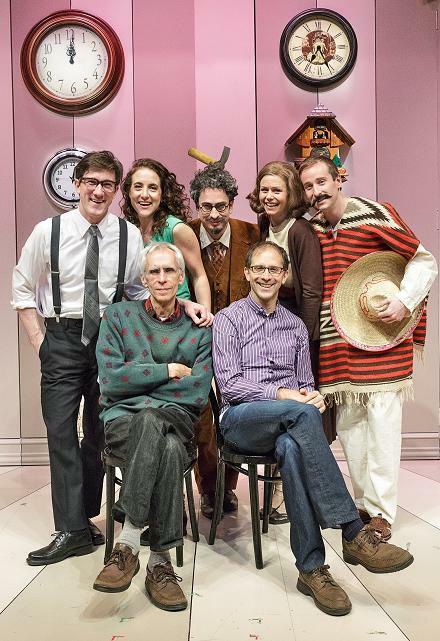 “Old Hats,” at Signature Theatre’s new Pershing Square Signature Center, already extended through April 14th, is a hilarious array of vignettes which tickled every funny bone in my body. There is foolishness a plenty, and audience participation, in the above mentioned “Cowboy Cinema” and in the marvellous “A Magic Act,” for which Irwin gets to don a dress and show off his legs. “Old Hats” will appeal to even the curmudgeons among us, as attested to by my delight in the program. There were plenty of historical precedents for the use of paramilitary reinforcements before Bush the younger sent two hired guns for every soldier into Iraq. It’s true that most of those did not involve using private companies to run operations in hot zones, but as long as there have been wars, there have been combatants whose allegiance to the cause was strictly for pay. Mercenary corporations treat both their own personnel and combatants cavalierly. 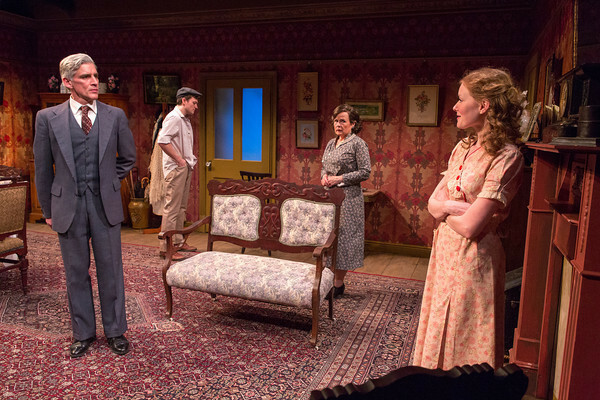 In “On The Head Of A Pin,” in a Strangemen & Co. production at 59E59 Theaters through March 10, their actions fall under the scrutiny of an intrepid reporter. Lily Strauss (Sofia Lauwers) lost her job and reputation making allegations against them, but this time she has proof that Caliban, the company authorized to send Arab-speakers to interrogate prisoners, is involved in ugly dealings in Iraq. 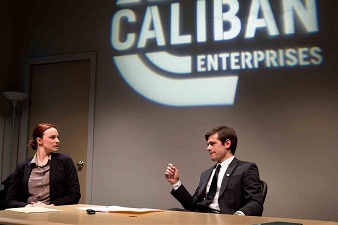 Chris Conrad (Jason Ralph), Caliban’s head of HR, doesn’t look too closely at Sarah Kennedy’s (Emily Fleischer) motives when he sends her to an Iraqi prison despite the fact that he wonders why a newly wed wants to go so far away from her husband. Her boss, Kathleen Crane (Jen Tullock) browbeats her into forcing confessions. Sarah’s only ally in her new job is a soldier named Russell Clark (Marcus Callender) whose offer of help to her goes very much awry. Frank Winters’ “On The Head of a Pin” is deeply earnest even when it’s funny. From Gwen (Devin Dunne Cannon), the news intern who assists Lily in her expose to the interim editor, Jon Lowe (James Ortiz), the characters are all dedicated and righteous. Sadly, sincerity is not enough to make a drama work, even one that is as hard-working as this one. For more information about “On The Head of a Pin,” please visit www.59e59.org. It’s "All In The Timing"
director JOHN RANDO (left) and playwright DAVID IVES. photo © 2013 James Leynse. 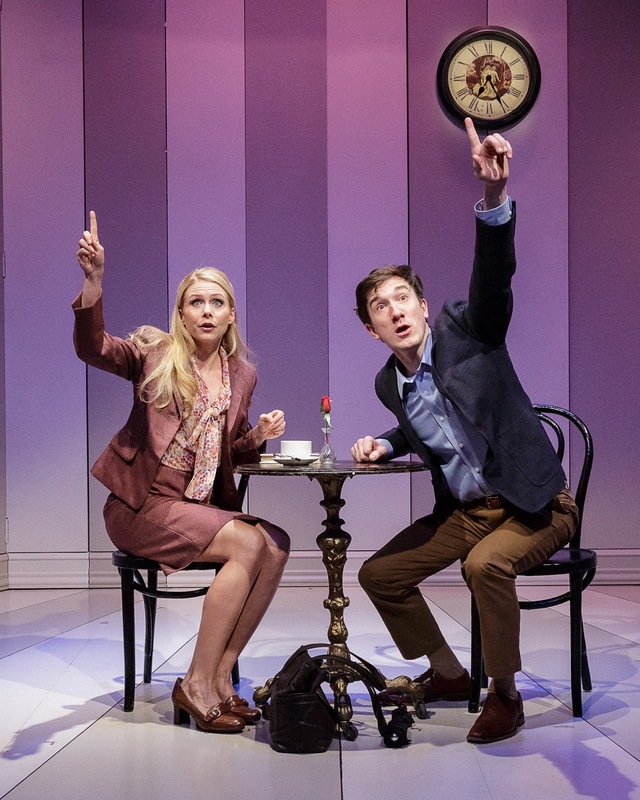 Whoever it was, David Ives is on board at any rate with his 6 short playlets, “All In The Timing,” in a Primary Stages revival at 59E59 Theaters through March 17. In its premier in 1993, this packet of one act comedies was hailed as masterly. 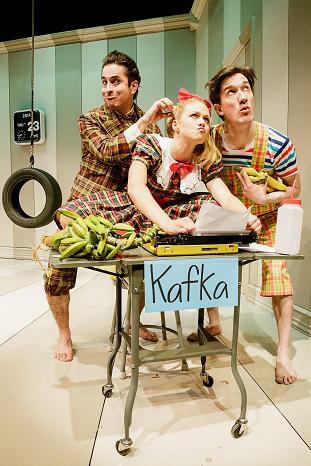 (l-r) MATTHEW SALDIVAR, LIV ROOTH and CARSON ELROD in the PRIMARY STAGES 20th anniversary production of ALL IN THE TIMING. photo © 2013 James Leynse. 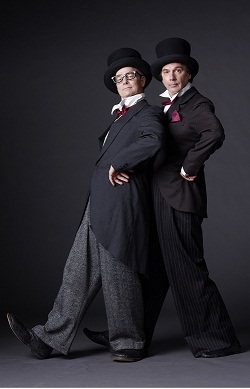 Unfortunately, mere zaniness does not guarantee hilarity Several of these sketches fall flat. Some contain the germ of a laugh; these are merely based on a funny premise Others are too tedious or too precious. Happily, a couple are truly wonderful. All six of these one-acters are very off-beat. A cafe pick up in “Sure Thing” runs through all the permutations of a flirtation in rapid fire. 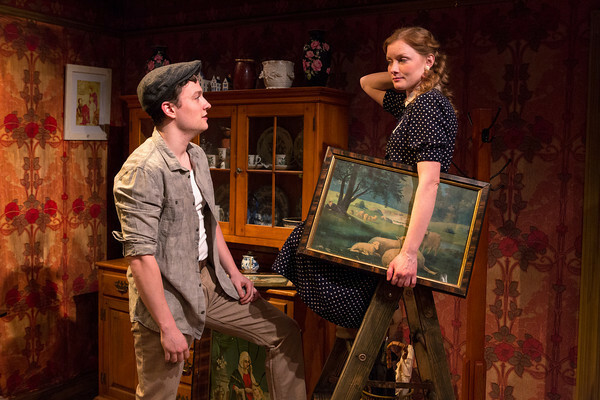 (l-r) LIV ROOTH and CARSON ELROD in the PRIMARY STAGES 20th anniversary production of ALL IN THE TIMING. photo © 2013 James Leynse. “The Philadelphia” hits a high-point on this– or admittedly, any– program. It’s at a fine tuneed level of absurdism. Ives coul d not have found a better cast to deliver this material. 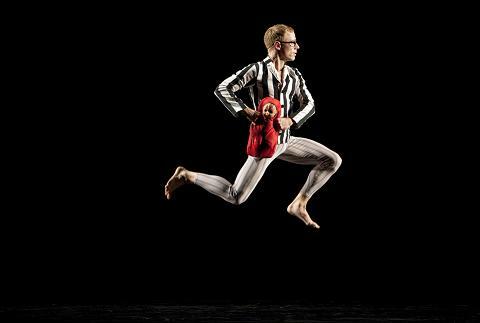 Carson Elrod does pratfalls and “tongue stoppers” with equal grace. Each fall and every syllable he delivers is a surprise no matter the set-up. In “The Universal Language,” Jenn Harris’s verbal slapstick is as screamingly funny as Elrod’s physical falls. For more information about “All In The Timing,” please visit http://www.primarystages.org.